Kevin Boram is a Chartered Accountant with over 20 years’ experience of developing major strategy projects for a major energy company. He has been a school governor for approximately 12 years for a primary and special needs school. Kevin is a member of the local Rotary Club and is an Adur District Councillor for Buckingham Ward. 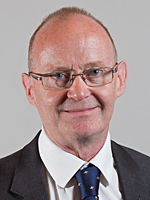 Kevin is an Adviser to the Cabinet Member for Finance and Resources in relation to Procurement and Contracts.